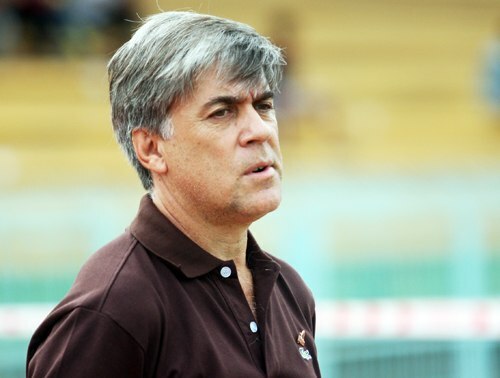 VietNamNet Bridge – Failing to improve the poor performance of the team, Argentinian coach Marcelo Zuleta has been dismissed. Argentinian coach Marcelo Zuleta has been dismissed. This is the second time Dong Tam FC fired its coach after bad performance. Zuleta’s assistant Ngo Quang Sang will temporarily take the hot seat. Sang was an assistant coach and trained youth teams of Dong Tam. The reason for the dismissal, according to Dong Tam FC’s Chairman Vo Thanh Nhiem, is given that the club's achievement was not improved. The 49-year-old Argentinian coach adjusted the policy slowly and used players in irrational way, especially in the game against Binh Duong FC on July 7, in which Dong Tam lost 2-5. To stimulate the spirit of players, Dong Tam has offered a reward of up to VND300 million ($15,000) for a win game. Before the match on July 7, Long An Province authorities presented the team with VND100 million ($5,000) to encourage the whole team. However, under the management of coach Marcelo Zuleta, the team’s performance is increasingly poor. Since Zuleta took over the team from Portuguese Coach Francisco Vital in the 8th round, Dong Tam’s performance has not been improved but got worse. Of the seven games with the 49-year-old coach, Dong Tam just won one, drawn one and lost five. It scored only seven goals. After being defeated by Binh Duong, Dong Tam is at the bottom of the rankings and is the brightest candidate for falling from V-Leage to the First Division Tournament next year. Dong Tam will face Hanoi T & T in the quarter-finals of the National Cup on July 11 at its home stadium in Long An Province.